White Cottage is a great vacation rental for anyone who loves the ocean and privacy. It’s in a quiet region of Grand Cayman, and sits steps away from the beach. Plus, the villa has a massive screened porch so you can relax outside without having to worry about the elements. Perfect beachfront villa for your family get-a-way! 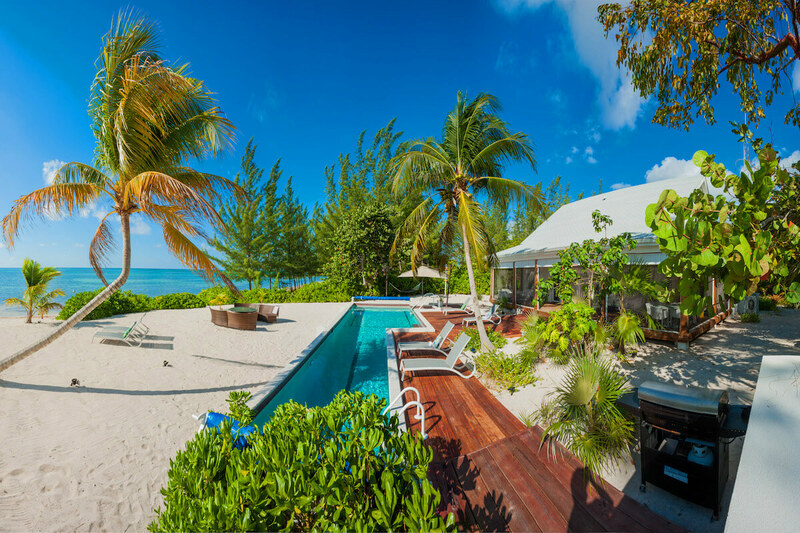 White Cottage is a beachfront villa with water sports, chic interiors, and central air-conditioning. This gated vacation rental sits on Half Moon Bay, minutes from the blow holes, botanic park, and an art studio. The villa sits directly beachfront on the wide and sandy beach. The villa has kayaks and paddle boards, so guests can make the most of the beachfront location. Back at the villa, there’s a private L-shaped pool for swimming laps and splashing around with the water toys. Guests can grill on the gas BBQ and nap in the shaded hammock. Inside the screened porch, guests can eat at the chic dining table surrounded by comfy chairs or lounge around the living area on the other side of the porch. Around the corner, play games at the ping pong table or watch TV. French doors lead into the living room, where guests can relax into couches and armchairs to watch movies or gaze at the sea. A highly polished wooden dining table sits adjacent, and there’s also dining at the breakfast bar in the kitchen. All-white counters, appliances, and accents enhance the gourmet kitchen, which is fully equipped. A cozy workspace is tucked between the dining table and kitchen, and there are board games for entertainment. All five of White Cottage’s bedrooms have views, Apple TVs, and a Sonos sound system. The ground floor holds three bedrooms, two near the living room and a Master Suite near the kitchen. The Master Suite features a king-sized bed, seating, a walk-in closet, and an ensuite bathroom with a whirlpool tub and walk-in shower. This suite opens to the oceanfront balcony and the screened porch. The second bedroom sits near the living room, with a king-sized bed and access to the oceanfront balcony. The third bedroom is adjacent, with two twin bunks, a twin trundle, and a garden view. These two suites share a bathroom with a whirlpool tub/shower combo. Upstairs, there are two queen suites that share a bathroom and overlook the garden. Even though White Cottage is on the southeastern side of the island, it’s only minutes from popular Rum Point, and guests can take a day trip to Seven Mile Beach. Villa is beachfront facing south. Car rental, private chef, butler, server, daily maid service, grocery and beverage shopping (pre-arrival and during your stay), liquor and wine delivery, nanny service, baby equipment, spa services, yoga and personal training, photography, and private airport transfer/car service, and VIP airport fast track can be arranged for an additional fee.